KOLKATA: Statistical highlights on day four of the opening cricket Test between India and Sri Lanka at Eden Gardens on Sunday. # Since posting 187 on Test debut vs Australia at Mohali in March 2013, Shikhar Dhawan(94) has posted his highest score in Tests in India. In his previous 12 innings on Indian soil, his highest score was 45 not out vs South Africa at Bengaluru in November 2015. # Dhawan's fourth fifty in Tests (apart from six hundreds) is his first against Sri Lanka. # Dhawan has been dismissed in the nervous nineties in Tests for the second time - the first instance being 98 vs New Zealand at Wellington in February 2014. # Shikhar Dhawan's 77.75 batting average of 77.75 is the highest among the Indian players with at least 600 runs vs Sri Lanka in Tests - his tally being 622 runs in eight innings (five Tests), including three centuries and a fifty. # Lokesh Rahul became the second player to register nine fifty-plus innings in Tests this year - all half centuries in eight matches. South Africa's Dean Elgar (5 centuries + 4 half centuries in 11 Tests) was the first to do so. Before Rahul, the last Indian batsman to accomplish the feat was Rahul Dravid - 5 centuries + 4 half centuries in 12 Tests in 2011. # The 166-run stand between Rahul and Dhawan is India's second highest opening partnership at Eden Gardens, Kolkata next only to the 191 between VVS Laxman and Navjot Singh Sidhu vs Australia in March 1998. # Ravichandran Ashwin (8 overs) and Ravindra Jadeja (1 over) have bowled nine overs - the least bowled by Indian spinners in the first innings of a home Test, surpassing the 16 bowled against West Indies in the 1987-88 Delhi Test. # For the first time in Tests, Rangana Herath has recorded a fifty while batting as number nine batsman - 67 off 105 balls. # His previous two fifties were scored by him as number eight batsman in Tests - 80 not out off 93 balls vs India at Galle in 2010 and 61 off 99 balls vs England at Chester-le- Street in May 2016. # Herath (67) recorded his highest score in overseas Tests, bettering the 61 vs England at Chester-le-Street in May 2016. # Herath's only other half-century in Tests is an unbeaten 80 vs India at Galle in July 2010. # Herath became the first number nine batsman to register a fifty vs India at Eden Gardens, Kolkata. With his excellent knock, he has equalled a Sri Lankan record for the highest innings by a number nine player vs India. Muttiah Muralitharan had posted 67 at Kandy in 2001. 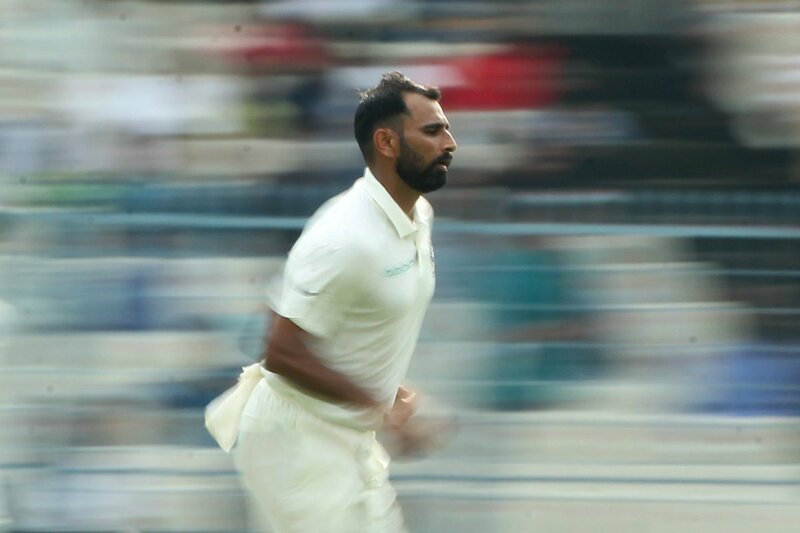 # For the third time (Bhuvneshwar Kumar (4/88), Mohammed Shami (4/100) & Umesh Yadav (2/79) the Indian fast bowlers have bagged all ten wickets in a Test innings on Indian soil. The first two occasions for India a home Test were Kapil Dev (5/70) and Madan Lal (5/23) against England at Mumbai in 1981 -82 and Kapil Dev (9/83) and Balwinder Sandhu (1/45) against West Indies at Ahmedabad in 1983-84. 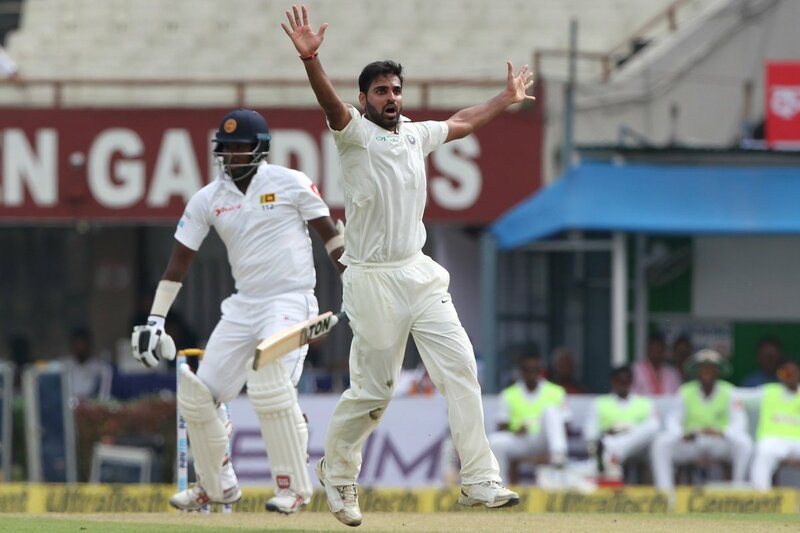 # Bhuvneshwar (4/88) has recorded his second best bowling figures in a Test innings on Indian soil - his best figures remain 5 for 48 vs New Zealand at Eden Gardens last year.